Fog is beautiful. The misty hazy environment creates mood and an ethereal feel, but strangely the images you capture may not look like what you saw. What is the reason? Typically fog forms in the late afternoon and extends through the early morning hours. Fog is comprised of water particles suspended in the air. Fog forms as a result of temperature differences between the atmospheric temperature and the dew point. Fog seen over water is caused when the air above the water is cooler than the water temperature and also forms when a humid cool air mass moves under a warm air. So why is fog photography problematic? Fog behaves like a massive soft-box that removes all directionality of the light. Light is scattered in all directions eliminating most of if not all the contrast. Your subjects and landscapes are rendered flat and de-saturated. Exposure – Not only does fog remove contrast and color, it reduces light. Since there is so much light loss you will need longer exposures. Fog unfortunately is not stationary; its movement will further obscure the scene. Higher ISO will help at the cost of introducing noise. As fog is made up of water particles it is highly reflective. This reflectivity tends to fool the camera meter and you end up with under exposed images. You will need to compensate your exposure by positively. The amount of compensation will vary based on the density of the fog. A +1 ƒ-stop compensation is a good place to start. Check the histogram making sure you are not loosing detail. Bracketing in ½ f-stops for added exposure is your best option. White balance behaves in strange ways in foggy conditions. Soot in RAW so you can correct he white balance in post processing. If you are not comfortable with RAW then set the white balance to cloudy. Autofocus is problematic – foggy conditions also confuse the autofocus system of your camera so you may need to switch to manually focusing. Before you step out to capture images in fog you need to understand that if you are in the fog (not in the periphery) there is the possibility of condensation. Fog is comprised of water particles that are condensing. So if your camera is colder than the outside air you will have condensation on your lens and possibly in the camera too. If your camera has weather protection then you are fairly safe. However if the camera has been allowed to acclimatize, condensation is less likely. Acclimatization can take 20 minute to half an hour. Use Ziploc® or similar plastic bags to enclose your camera and lens. Also please do not change lenses while your camera is exposed to the fog. Some condensation may still occur on the front element of the lens. Keep a lens cloth handy and wipe of any condensation that may develop. Composition – We all understand that including a strong element in the foreground of a landscape image will create the feeling of depth and give the image dimension. This concept becomes even more of a requirement when shooting in fog. The fog makes the scene look flat with minimum contrast and little dimension. However the closer the subject the less influence the fog has on it. Closer objects maintain more contrast and color and as they move further away the contrast and color diminish. So to create a feeling of depth scout the scene and include some strong foreground elements. The foreground element becomes the dominant compositional element and the rest of the scene transitions into the fog. These images portray a sense of calm. As fog reduces contrast it can be used to accentuate the shape of the object. 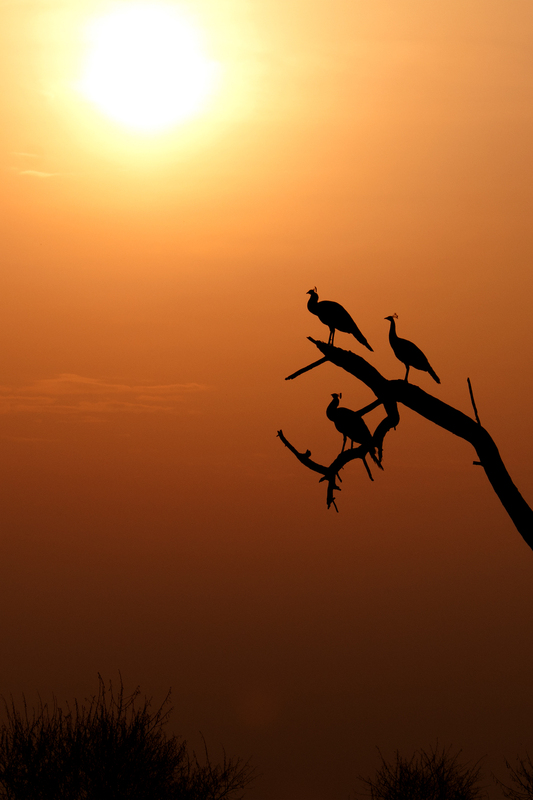 Using this you can create wonderful silhouettes, simplifying your composition. Bright foggy backgrounds create the contrast in the image. For silhouettes make certain you expose for the fog not the subject and compensate to the negative if you feel the silhouette is not dark enough. The image on the left was shot on a foggy morning in Bharatpur, India. Starting the last week in December through mid-February fog is a daily phenomena in Delhi and it vicinity. The peacocks are distinctly silhouetted against the orange glow of early light. The image below is in Cades Cove, Smoky Mountain National Park. This was captured in the Spring. The Smokys are well-known for the foggy, misty scenics. Here the trees make for an interesting foreground with low-lying fog in the valley. Fog will scatter light and though light is softened, fog will also make light streaks defined and much more visible particularly when emanating from a point source. Images of trees in the fog at sunrise where light rays streak out in radial patterns make for some exceptional images. A little technique and camera position will make these light rays stand out. The denser the fog the easier it is to get good light rays. In lighter fog make sure you position your camera so the lens is pointing close to but not directly at the light source. Remember, the closer the light source the more defined the light rays will be, as long as you keep the light source at an angle to your camera. Photographing fog from afar is no different than photographing low-lying clouds. Use the same techniques and elements of composition. In this situation you do not have the problems of reduced contrast, definition and color. Make sure your correct for white balance and exposure. You may want to tone your fog images with a little blue tint using the white balance or a toning layer. 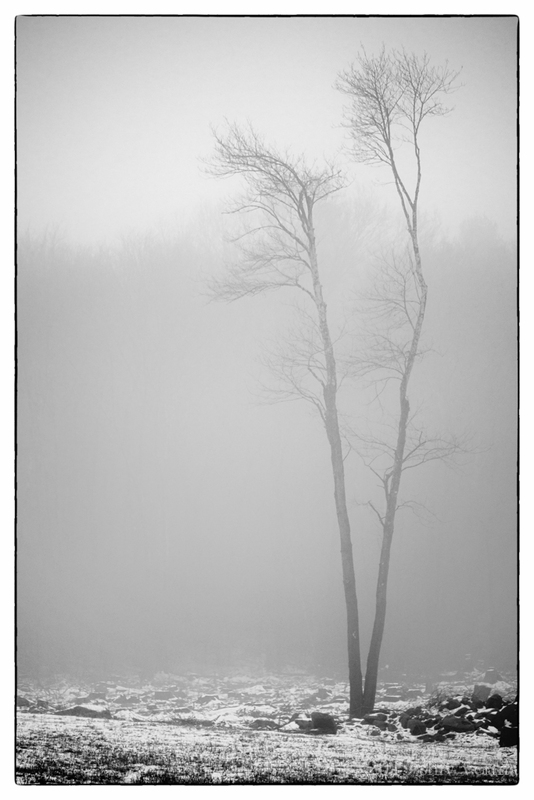 Converting your fog images to black and white or monochrome variant can be very interesting. If you know there will be fog, be prepared ahead of time and take advantage of what this atmospheric condition offers. Fog can move fast or slow so use your shutter speed for the best results. 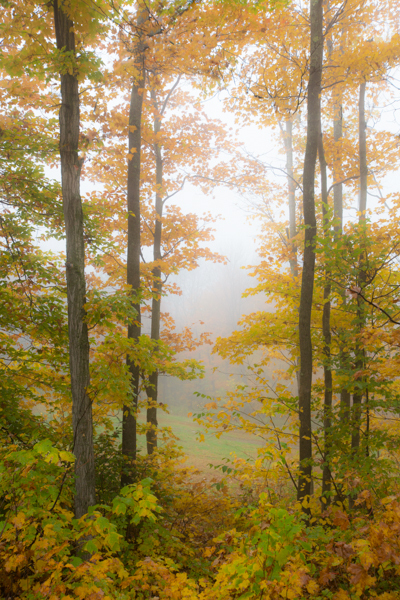 Fog can be dense or sparse – manage the exposure for the greatest impact. Experiment and practice. Use fog to its maximum and capture those moody scenes you will be proud of.